Become a fan! Follow me on Pinterest! As we all recover from Hurricane Sandy, please remember that there is no better way to stay warm than with a custom, handmade Memory Quilt! Lots of Memory pillows, baby quilts, school quilts, and memorial quilts will be ready for the gift giving season. If you are interested please contact me ASAP. My schedule is filling up fast! New this month is an embroidery option to personalize your quilt or pillow even more! I can add names, birth statistics, dates, or nick names to your quilts or pillows making them even more special. Simple click here to learn more. 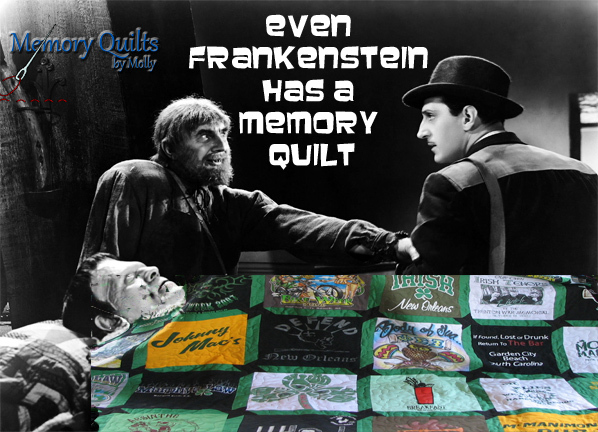 Go ahead wrap yourself in the warmth of a handmade quilt filled with your wonderful memories! 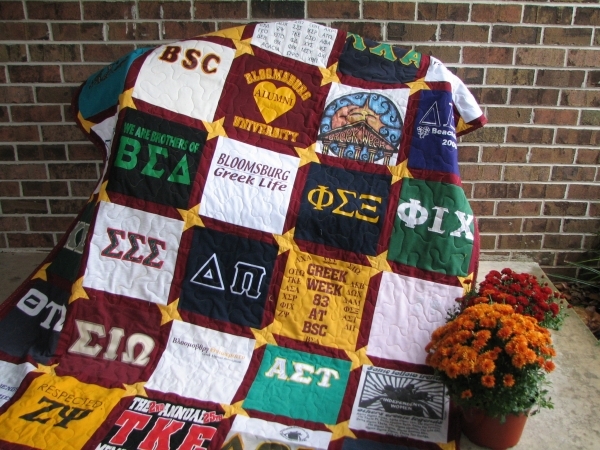 Each year, Memory Quilts by Molly donates one quilt to a worthy organization.This year's recipient, Bloomsburg University Greek Alumni Association, recieved the traditional quilt, pictured above, that proudly displays the many Greek social organizations that are on the campus of BU, my alma mater. The shirts that are included in this quilt are more than 30 years old! This quilt was used in the homecoming parade and will be hung in the Alumni House on campus. If you are interested in a FREE quilt for your organization, please contact me to discuss: immfish@comcast.net. Or, click here to learn more! This quilt was made for a friend of mine who recently lost her husband. May it bring her warmth and comfort in the days ahead. Jacob and Ryan were born in 2007 ans 2010. Their adorable baby clothes make this baby quilt so special. It measures 54" by 54" and is backed with super soft light blue flannel. From bib overalls to little onsies with floppy bunny ears-this quilt is truly a one-of-a-kind gift made for sweet little boys, and their mom of course! A new embroidery machine helps to add extra personalization to your quiltor pillow! 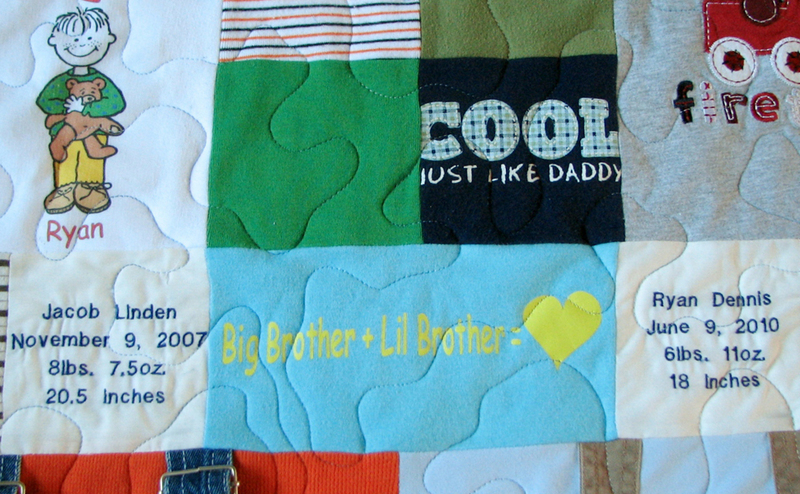 In this baby quilt the boys birth statistics were added. I have a new favorite t-shirt that looks fantastic in quilts! It is the homemade variety with hand prints, foot prints, googly eyes and pom poms. If you have these shirts make sure that you save them. They are so precious. Pictures of finished quilt to follow. 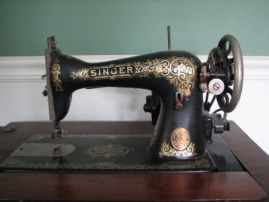 Since 2009, Memory Quilts by Molly has been making the highest quality quilts in the area. You get to choose from 3 different styles! Support a local business and the local economy! Copyright © 2012 Memory Quilts by Molly, All rights reserved.